I know that earlier on this week I said I was stepping back from the whole linky party thing for a bit but I could no more miss sharing the things I know than I could blogging on a Tuesday. Though there was another reason that compelled me to put fingertips to keyboard today. Funnily enough it was stupid* Karl Stefanovic on the Today Show when he was interviewing the rather lovely Samuel Johnson. As you may or may not know the incredibly wonderful Samuel Johnson is riding his way around Australia. 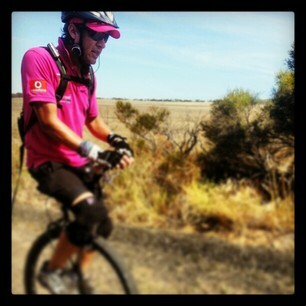 On a unicycle no less. Why is he doing that I hear you ask? His sister Connie has terminal breast cancer and this is Samuel's way of raising awareness and vital funds for this terrible disease. According the Love Your Sister website it all started as a joke in the kitchen but turned into a promise. I know that the Love Your Sister campaign is beyond awesome. If you haven't already head, over and check out where Samuel is. And if you have some spare cash, there is a donation page there as well. I know that I am hoping to get the opportunity to talk the man himself. If you have any questions you would like me to ask then send them through. I know that breast cancer affects far too many women. In 2008 there were 159,649 women alive in Australia, who had been diagnosed with breast cancer in the previous 27 years. It is estimated that in 2013 14,940 women will be diagnosed with breast cancer. That works out to approximately 40 women every day. That's right it is expected that every day this year 40 women will discover they have breast cancer. Crazy huh? It is also estimated that this year 2700 will lose their battle with breast cancer. That is on average 7 women a day dying as a result of breast cancer. On the upside though there are also a whole heap of statistics to show that the 5 year relative survival rate from breast cancer has increased significantly in recent years. If you would like to read more about these check out here, which coincidently is where I got all the above info from. I know that one of the main messages Connie and Samuel want to put out there is the importance of early detection. There is every possibility if Connie had been diagnosed earlier the story would be different. Be breast aware peoples. Be. Breast. Aware. Self check regularly. If you don't know how to self check make an appointment with your GP and get them to show you. While you are at the GP though get a pap smear as well. You can also check here for some more info on self examinations for breast lumps. I know that all cancers are best fought with early detection. If you have a family history of cancer make sure you regularly check in and get tested for what you can. I know that while writing this I have decided to that I will also Flog it With Some Grace, because the more people that read this the better. Please do your part and share, tweet and like. There are plenty of buttons below to help you. *Karl just in case you read this I actually think you are more annoying than stupid and this is based mostly on the fact of your job. I am against all morning show hosts. I find them all annoyingly stupid. I fail to see how anyone who gets up at the ridiculous times they do can be as chipper as what they are. All the time! Wonderful post Rhianna and a reminder to all of us ladies to be aware and check ourselves. I lost a dear Aunty to breast cancer a few years ago, and currently my MIL has secondary bone cancer which spread from breast cancer. She routinely had her mammograms until age 70, then for some reason thought she didn't have to have them anymore...and then this happened. Sigh. It's even worse to see so many younger women with it too. What a great thing for Samuel Johnson to do. P.S. Karl Stefanovic and co are so chipper that early because they are paid ridiculous amounts of money. The end. Thank you for your kind words Ness. Sorry for your loss. Almost everyone I know has been affected by this disease one way or another. I hadn't thought of the money factor as the reason for their chipperness, I reckon you are right on that! A few of my beautiful friends have fought the hard fight, and one still is. Breast cancer doesn't just stop when you have the all clear, it's something that affects your body and soul for the rest of your life. Way to go on getting the message out there lovely! Yes it is a complete life transformation isn't it. Sending some fairy wishes and butterfly kisses to your friend currently fighting and my condolences to the loved ones of those that didn't make it. Thanks for your support and sharing the post. Thanks Emily, we do all need to talk about it a lot more. As terrible as it is for so many this disease has become a way of life and as such it is something we all need to deal with together. I must admit that I actually get quite emotional when talking about it as it is just so damn scary to think your whole life can be instantly turned upside down. I hadn't taken into account the make up artists either and I really did mean Karl no ill feelings, he is such a big supporter of the cause and is helping get the word out there as well that I wouldn't want to offend him. Thanks Victoria. I can't stress enough how the self awareness message still needs to get out there. Early detection really can be the life or death difference sometimes. I love to see promotion of the wonderful Samuel Johnson and Love your sister- I think he is amazing riding his way around Australia. Great post raising awareness of Breast cancer. I agree, I saw Samuel on The Project (I think)? I think he is an amazing young man doing a wonderful thing for his sister and a very worthy cause! I love Samuel Johnson! Can you ask him why all of the good shows he's on get axed? Secret Life of Us, Rush, I loved them both and they were CANNED! What's the go? What a great post - so good to raise awareness of such a dreadful disease !! Thank you ! Wishing you the best weekend ! Thank you Rhianna, what an amazing story. I have just read their blog and story, and am now crying. I want to follow their journey, what a true act of devotion.